Gene Simmons of KISS entertains the FIDF Gala in L.A.
Friends of the Israel Defense Forces (FIDF) raised a record $53.8 million at its annual Western Region Gala on Thursday, Nov. 2, 2017 at the landmark Beverly Hilton Hotel. The figure represents the most money raised at any single FIDF event in the organization’s history. 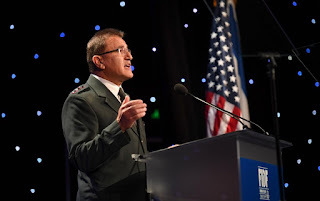 The sold-out gala, which has become one of Los Angeles’ premier charitable events, united some 1,200 supporters from across the country to support the brave men and women of the Israel Defense Forces (IDF). Presiding as the evening’s master of ceremonies was Israeli actress and model Moran Atias. 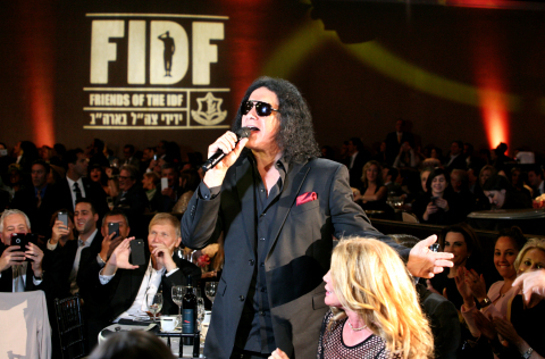 The event featured special performances by singer Seal, The Tenors, David Foster & Friends, and Gene Simmons. wounded in their country's civil war. Col. (Res.) Dr. Salman Zarka, director general of the Ziv Medical Center in Israel, described Israel’s extraordinary humanitarian initiative “Operation Good Neighbor,” which provides aid to refugees and victims of the Syrian civil war. Zarka, with 25 years of experience in the IDF Medical Corps, has led a staff that has treated hundreds of wounded Syrian civilians. Ethiopian-Israeli Lt. Mazal Zemmru, 23, leads training of Kfir Brigade recruits in the Jordan Valley. She discusses her work and her family life - including her relations with Ashkenazim and Sephardim. Austrian-raised, I.D.F. artillery Sgt. Leah Duxler discusses anti-Zionism in the life of European Jews old and young - and her views of Zionism -which propelled her and others to emigrate to join the Israel Defense Forces. Do you remember John Goodman's movie character, Walter Sobchak in The Big Leibowski, who converted to Judaism for marriage and all through his life became a devout contributor to Jewish culture? JooTube spoke with Roman-Catholic-raised, US Marine Lt. Col. (ret.) David McCarthy. The veteran of Iraq and Afghanistan Wars declares respect for FIDF - which assisted his once, lone-soldier son, Sgt. Joseph Daniel McCarthy, with a flight home to the United States. Lt. Col McCarthy also tells us of his impression of US - Israel military collaboration and how moved he was by the appearance of Israeli parents of slain border-police Corporal Hadar Cohen that he gave her parents his Marine Challenge-Coin. Friends of the I.D.F. Gala will return to Los Angeles on November 1st, 2018.